My last day in Paris was quite short since my train would leave around noon. Montana had to go to class so she left me wandering around Paris by myself. There's a few things I hadn't seen yet like during my visit like Le Pont Des Arts so that's where I headed first. There was almost no one there and with the sunrise it looked so beautiful. In Rue Bonaparte I came across this shop which sold lots of Alaïa clothes, and I kind of fell in love with those suede boots. If you walk all the way down Rue Bonaparte you arrive at the St Germain de Pres church. But more importantly opposite the street you'll find one of my favourite restaurants ever, Le Relais de L'Entrecôte. They have this restaurant too in London and you can read my review here. This one in St. Germain was the first one I visited, years ago! There's a really big Ladurée also on Rue Bonaparte, for the fans. Citypharma, where we went on Saturday, is near Boulevard St Germain on Rue de Four. I returned here because I didn't manage to have a proper look at everything because of the chaos we experienced on Saturday. At Citypharma you can find everything you'll find at regular French pharmacies except this one is bigger, a little cheaper and therefore really crowded most of the time. Since I was here around 10 am on a Monday it wasn't busy at all so I could have another good look at everything. If you like French beauty brands you should definitely put this on your Paris to-do list. I'll make a separate post with all the things I got here. I then walked back across la Seine, to the Louvre. It was still lovely and quiet, and really enjoyed those typical but magical Parisian views. For those of you wondering how I'm getting on with my Givenchy bag: I've been using it loads and I'm very happy I chose the bigger Antigona because so much fits in this bag! Next I walked over to Rue St. Honoré, where to my surprise the shops weren't opening till 11 am, which meant I had to skip Colette this time. It's one of the most over-hyped yet coolest stores in Paris. 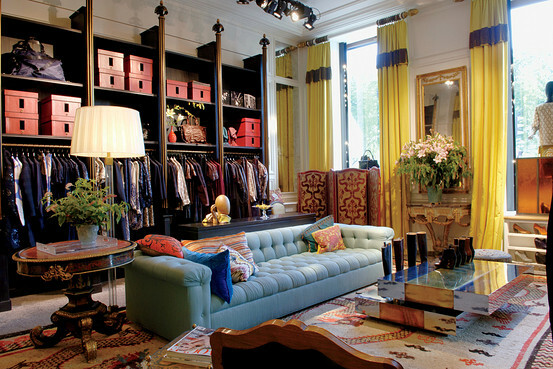 Colette always has the most amazing selection of fashion, gadgets, magazines, beauty, books and music. A little disappointed, I went to Monoprix (supermarket) to buy some of my favourite Poilâne walnut bread. Look at how lovely the vegetable section looks, I wish it was like this in London stores too. 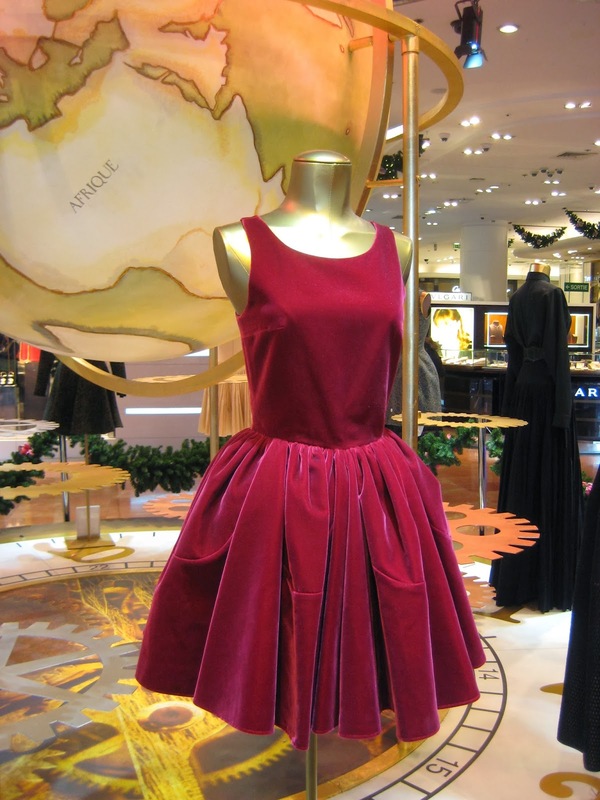 Not sure what to do with my last 30 minutes in Paris, I headed to Galeries Lafayette again where I saw the most Christmassy dress. Before heading to Gare du Nord, lovely Montana made sure I ate some French baguette and soup for lunch. 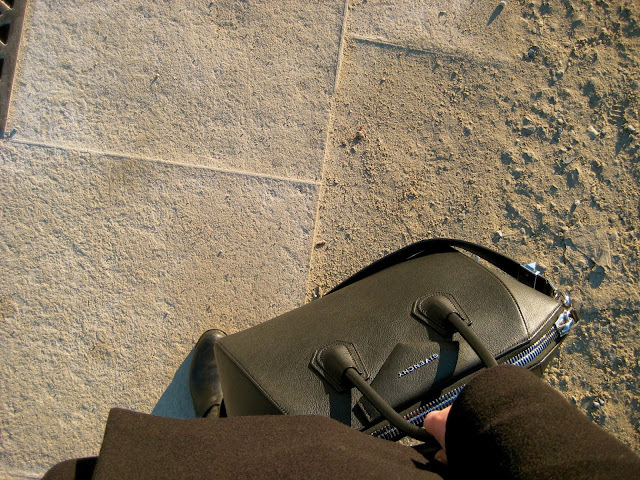 I wasn't ready to go just yet, since my list of things to do was even bigger than when I arrived in Paris. Thank you Paris, thank you Montana for the best long weekend! I hope you enjoyed reading my Paris diary!